PROVENGE® How is PROVENGE Given? PROVENGE is infused 3 times, with infusions given approximately every 2 weeks. 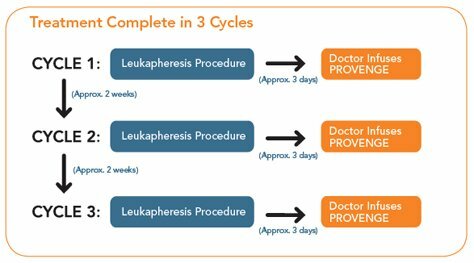 Each infusion of PROVENGE is about 3 days after your leukapheresis procedure. After 3 infusions, your treatment with PROVENGE is complete. Your doctor’s office will work with Dendreon ON Call to create a personalized treatment schedule just for you. Dendreon ON Call is staffed by a dedicated team of specialists who provide support to your doctor’s office throughout your treatment, including scheduling help. A sample schedule is shown below for your reference. Once your schedule is confirmed, you will receive a Comfort Kit that will have information about PROVENGE. The Comfort Kit will also include items to make your treatment as comfortable as possible. It is important to keep all your scheduled appointments and to arrive prepared. Your dose of PROVENGE, once manufactured, has a short life span. If an infusion appointment is missed, your personal dose of PROVENGE will expire and be out of date and can no longer be used. You will have to repeat the leukapheresis procedure in order for a new dose to be manufactured. If you miss a leukapheresis procedure appointment, or the procedure cannot be performed, then your infusion appointment and all other remaining appointments may need to be rescheduled. To prevent the need for repeat procedures, set reminders for yourself. 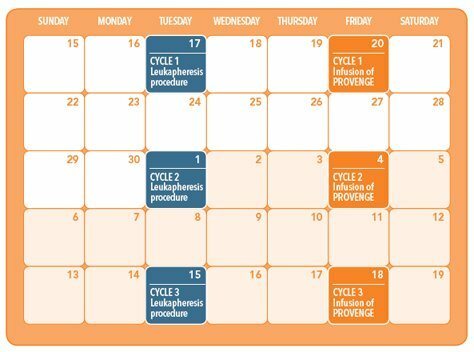 You can use the calendar provided in your Comfort Kit, and you can also ask family members or friends to mark these dates on their calendars as well. You must bring a government-issued photo ID, such as a driver’s license, to all your appointments. It should have the same name (first, middle or middle initial, and last name) as used for the records at your doctor’s office at the time of enrollment for PROVENGE treatment. This will allow the doctor’s office to match your dose of PROVENGE to you.